Over the past decade, government spending more than doubled from $33 billion to $71 billion - and is set to increase further. Ahead of Budget Day on Feb 19, Insight looks at where spending demands are greatest: healthcare, infrastructure and jobs. The first of a three-part series, this week's feature examines Singapore's social policies, and pressing issues in healthcare. Shaping policy in response to social needs is an ever-challenging - and changing - process. Just ask Deputy Prime Minister Tharman Shanmugaratnam. Back in the mid-1990s when the Internet age was starting, many families were worried that their children would lose out because they could not afford computers. The Government's solution: it would "socialise" computer use. Public computers would be installed in schools and community centres, announced the Education Ministry's deputy secretary (policy) - Mr Tharman. There would be no subsidies for low-income families, he said then. But as the Internet took off, this stance later changed. Government initiatives expanded to include subsidies for needy students to buy new computers and to subscribe to Internet broadband. This flexibility to adapt to changing needs can be seen nowadays in the move to increase social spending for an inclusive society that gives the needy a leg-up. It stands in contrast to earlier years of nation-building, where the emphasis in social policy was self-reliance. "It's in the last decade that you see a decisive shift, a deliberate tilt, towards tempering the inequalities of life and ensuring the lower-income group keeps pace with the whole society as it moves up." He outlines some of the key milestones: Workfare in 2007, which supports older low-wage Singaporeans who continue working and training; the Progressive Wage Model in 2012, which sets wage floors for workers' skill levels; SkillsFuture in 2015, which encourages lifelong learning; and MediShield Life, also in 2015, a health insurance plan helping to pay for costly hospital bills and treatments. With such moves, social expenditure - which covers healthcare, education and social and family development, among others - ballooned to about $34 billion in 2016, from $12.7 billion a decade earlier. Last year, it comprised $37.8 billion - half of total government spending. Experts agree there has been a shift to the left in Singapore's social policies - in terms of wealth redistribution - although they disagree as to the extent. In the past, social support tended towards short-term aid for the unemployed, the ill, those with disabilities and the needy old, says National University of Singapore (NUS) economist Chia Ngee Choon, noting: "There was an aversion towards welfarism as it was feared that this may lead to a 'crutch mentality'." But there was a growing acknowledgement that not everyone was benefiting from Singapore's economic growth. Some were falling way behind. The 2005 Household Expenditure Survey showed that while average income for households rose 1.1 per cent annually from 1998 to 2003, those in the bottom 20 per cent saw their incomes fall 3.2 per cent a year in the same period. By contrast, the Household Expenditure Survey in 2014 found that the income of those in the bottom 20 per cent rose at the highest rate of 6.6 per cent annually from 2008 to 2013, even as average monthly household income increased by 5.3 per cent annually. The Singapore Armed Forces activated a total of 8,000 troops and 700 vehicles in its biggest mobilisation exercise since 1985 that ended yesterday. The two-day exercise also featured two firsts. 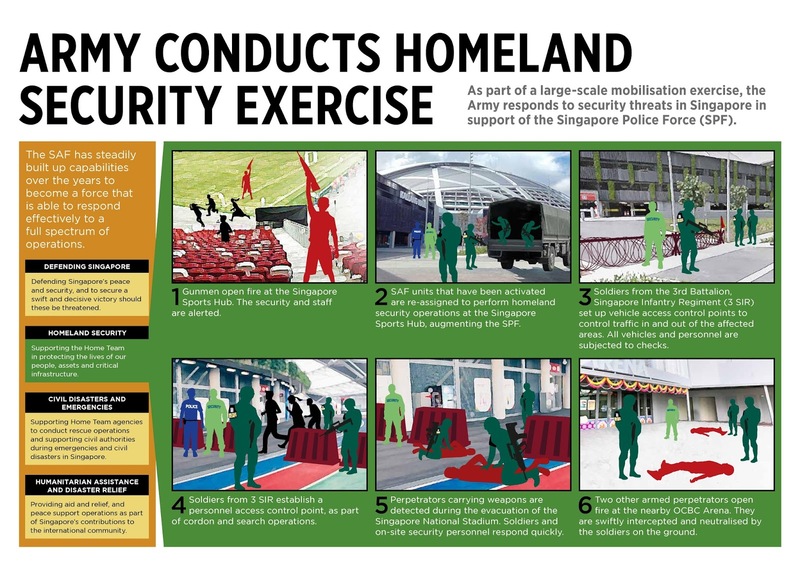 One, troops worked hand in hand with the police in a homeland security operation in responding to a simulated anti-terror exercise at the Singapore Sports Hub. Two, the exercise also tested out for the first time a new enhanced Mobilisation and Equipping Centre (MEC) at Selarang Camp in Loyang - a one-stop place for recalled operationally ready national servicemen to draw their combat gear and be ready for duty faster. 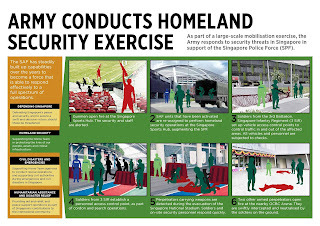 Speaking to the media near the end of the exercise, Defence Minister Ng Eng Hen said: "This (mobilisation) included an anti-terrorism exercise that we did together with the police force. "So whether it's for humanitarian action, low-intensity conflict or terrorism threat, or even in the unthinkable scenario of outright war, I think Singaporeans have that confidence that the army is ready, and NSmen are committed and ready to be equipped, to be able to fulfil their mission." The Selarang Camp MEC - enhanced by a four-storey 147,020 sq m building completed last year - has helped to improve the army's ability to mount a sizeable force within hours by cutting the time needed to mobilise and equip the troops. About the size of 22 football fields, it is even able to store military vehicles under the same roof in a controlled-humidity facility, allowing electronic systems to be kept on board the vehicles when not in use. Previously, such systems had to be removed and disassembled by technicians. Facilities such as self-registration kiosks, as opposed to manned counters, also help. The kiosks reduce the registration time from one minute to about 20 seconds, and manpower required from 24 to eight people. 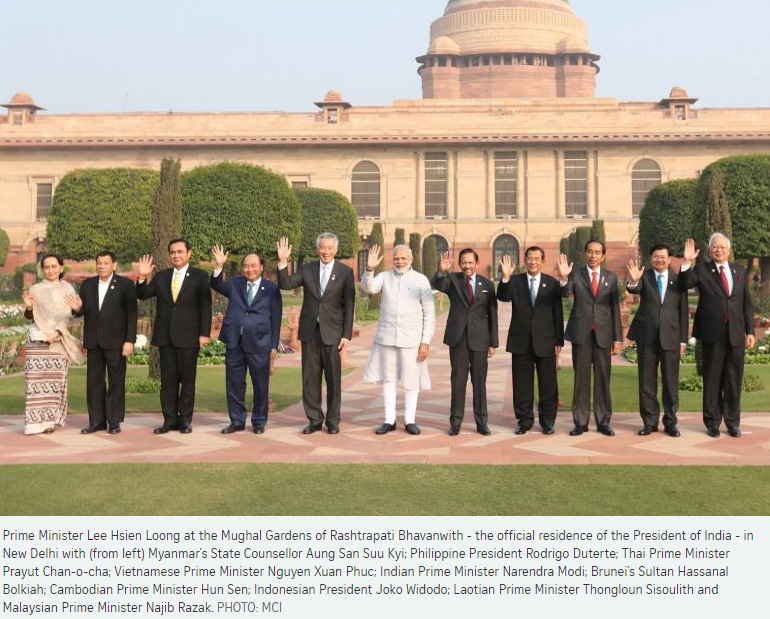 India rolled out the red carpet for the 10 ASEAN leaders yesterday, as they gathered in New Delhi to mark 25 years of ASEAN-India relations. At a commemorative summit, the leaders renewed their commitment to enhance the multifaceted ties between the South-east Asian grouping and its neighbouring South Asian giant. The summit was co-chaired by Prime Minister Lee Hsien Loong of Singapore, which chairs ASEAN this year, and India's Prime Minister Narendra Modi. The two expressed hopes for ASEAN and India to draw closer to each other. They also identified areas of mutual concern. PM Lee said: "We believe that India makes a major contribution to regional affairs, helping to keep the regional architecture open, balanced and inclusive." Noting South-east Asia's deep cultural and historical ties to India, he called for an enhancement in trade, investments and connectivity. He cited two projects to take relations forward. First, the Regional Comprehensive Economic Partnership - a trade pact ASEAN and six countries, including India, are negotiating. He hopes talks can conclude this year, he said. The second is the ASEAN-India Air Transport Agreement, which he said can enhance people flows, bringing benefits to both sides. PM Modi said India hopes to deepen cooperation with ASEAN in their shared maritime domain. Disaster relief efforts, security cooperation and freedom of navigation are focus areas for this maritime tie-up. He added: "India shares ASEAN's vision for peace and prosperity through a rules-based order for the oceans and seas. Respect for international law... is critical for this." The summit takes place at a time of geopolitical change and as ASEAN's key partners - including China, India, Japan and Australia - seek to deepen their engagement with the grouping. 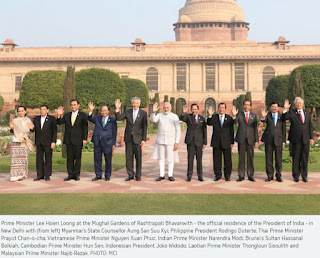 ASEAN-India relations have grown considerably over the past few decades. India viewed the regional grouping with suspicion during the Cold War. But relations took off in the 1990s, with then Prime Minister Narasimha Rao's "Look East" policy. Relations have since extended beyond economics to cover security and other issues. The two sides became "strategic partners" in 2012. After PM Modi took office in 2014, the "Look East" policy was renamed the "Act East" policy. Celebrations will reach a climax today at the Republic Day Parade. ASEAN leaders will attend as chief guests - the first time India has hosted more than one chief guest at the event to mark the day its Constitution took effect. ASEAN is deeply honoured by the invitation, said PM Lee. Yesterday's summit adopted the Delhi Declaration, which reaffirms the commitment of ASEAN and India to work closely together on issues of mutual concern and ensure an open, transparent, inclusive and rules-based regional architecture. Singapore can play a critical role in the China-led Belt and Road Initiative (BRI) as a global financial hub, providing the banking and legal support for projects as well as facilitating in the "software transfer" to ensure projects are sustainable once completed. 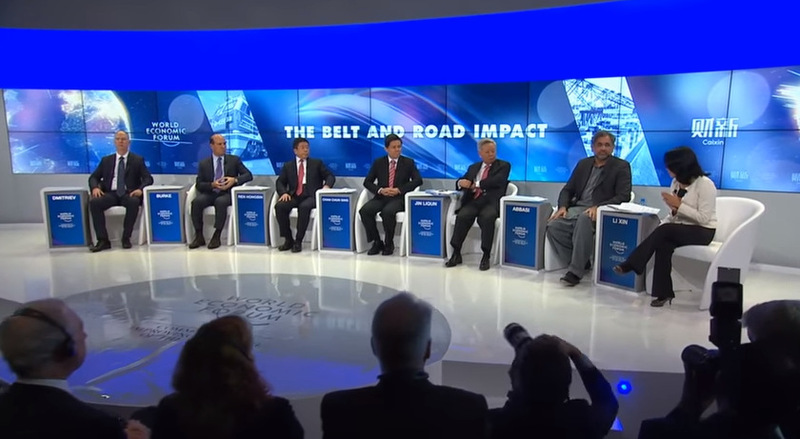 This was spelt out by Mr Chan Chun Sing, Minister in the Prime Minister's Office and NTUC chief, yesterday to an audience of top business and political leaders during a session at the World Economic Forum on the One Belt, One Road Initiative, a showpiece project of China's President Xi Jinping. Noting that Singapore was happy to be working closely with China on this major initiative, Mr Chan added that Chinese officials often pointed to the 33-85 figure to remind their Singapore counterparts of the role the Republic plays. This refers to the fact that 33 per cent of all outward investments related to the BRI flows through Singapore, while 85 per cent of inbound investments for the initiative makes it way into China through Singapore. As a major financial hub, Singapore was able to do this, syndicating loans while also providing the legal framework for them, and also ensuring the transfer of management know-how to the local community. He was speaking on a panel discussion which was organised by Chinese media group Caixin and included Pakistan's Prime Minister Shahid Khaqan Abbasi, Asian Infrastructure Investment Bank (AIIB) president Jin Liqun, and business leaders from China, Russia and the United States. Taking up the question on how BRI projects might benefit local communities, Mr Chan said that these should aim to be economically viable and sustainable to begin with. In the mid-term, these should aim to be catalytic, uplifting communities by adding to their capacity, including the ability to take over and successfully manage projects and build on them once the foreign partners have moved on. For the longer term, the projects should try to show the kind of power that China aimed to be in the world, one that seeks to use its power and position to build a global system that is inclusive and benefits societies around the world, he said. "With China's growth, there is tremendous opportunity for China to do good for the rest of the world," he noted. "This is an important historical opportunity for China to convince the rest of the world that actually its actions have a broader perspective of not just an immediate commercial gain to itself, or just to catalyse the local economy in the medium term. But more importantly, over the longer term, China is helping the world to build a better system that allows the world to participate in the next phase of growth for the world economy." If China could use its growing power to do this, it would "win the trust and confidence of the world", he added, pointing to the phrase "以德服人" mentioned by President Xi when he delivered a well-received speech in Davos last year. This refers to using one's abilities in a benevolent way to benefit the community. This, he argued, was the underlying philosophy of the BRI, as he saw it. Singapore and Sri Lanka have signed a free trade agreement that will provide tariff savings and grant Singapore firms greater access to the Sri Lankan market. The deal guarantees that for the next 15 years, Singapore companies will not have to pay tariffs on 80 per cent of product categories sold in Sri Lanka, said Singapore's Ministry of Trade and Industry (MTI). Tariff savings for Singapore exports will come up to an estimated $10 million annually, MTI added. The FTA also covers services, with both countries committing to open up markets for professional, environmental, construction, tourism and travel-related services. Prime Minister Lee Hsien Loong, who witnessed the signing yesterday, said Singapore firms will benefit from greater access to Sri Lanka, both in exports and investments. One key factor that led to the successful negotiations was the fact that the current Sri Lankan government is on a path of economic reform and liberalisation, he added. When Mr Lee arrived at the Presidential Secretariat yesterday, a band played Majulah Singapura and the Sri Lankan anthem before a 19-gun salute was fired. Mr Lee, who is on an official visit, then met President Maithripala Sirisena and Prime Minister Ranil Wickremesinghe. It was his first meeting with President Sirisena after the latter was elected in 2015. The two discussed education, trade, tourism, investments and drug policy, as well as ways to enhance cooperation. Mr Lee also encouraged Sri Lanka to enhance its engagements with ASEAN. Adding that it was a good meeting, he said of President Sirisena: "He is warm. He is an admirer of Singapore. He visits Singapore quite regularly on a personal basis, and he would like to do more with us." A group of younger leaders have banded together to mull over what Singapore "needs to do differently in the coming years" as its population ages, underscoring how the issue has become one of the most urgent challenges for the Government. 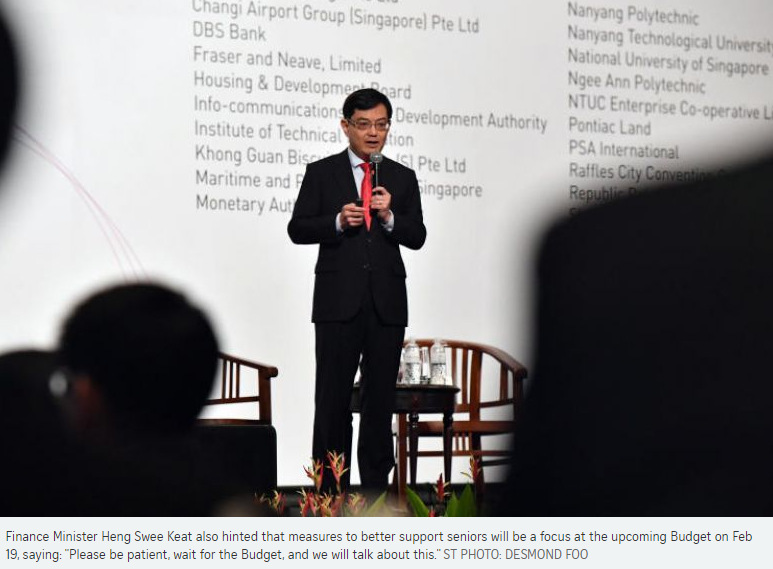 Finance Minister Heng Swee Keat yesterday also hinted that measures to better support seniors will be a focus at the upcoming Budget on Feb 19, saying: "Please be patient, wait for the Budget, and we will talk about this." At the Singapore Perspectives conference organised by the Institute of Policy Studies (IPS), Mr Heng said a group of leaders including Health Minister Gan Kim Yong, Minister for Culture, Community and Youth Grace Fu, Minister for Social and Family Development Desmond Lee and Speaker Tan Chuan-Jin are pondering the challenges the aged in Singapore face. They "are very concerned and are working together on this", he added. It is not starting from scratch, he said, noting that the Government had established, in 2007, a Ministerial Committee on Ageing, which is now chaired by Mr Gan. Mr Heng did not give further details of the group. Older Singaporeans, he noted, face a slew of diverse worries. Based on feedback garnered by pioneer generation ambassadors, the senior citizens are concerned about matters from healthcare needs to loneliness to finance - all currently addressed by different agencies and ministries. "What it shows very clearly is there is a gap at the front line, in terms of how well we are delivering that service to the seniors who need it," said Mr Heng. And so, going forward, "we will have to think about looking at the issues in a more cross-disciplinary way, across agencies and ministries", he added, saying the Government has to find ways for them to work better together. "Practically every ministry will have to deal with this demographic transition." Singapore today has around 500,000 people aged 65 and above. This is expected to almost double to around 900,000 by 2030. At the conference, which was focused on ageing, Deputy Prime Minister Teo Chee Hean, who oversees the National Population and Talent Division, said more can be done to support seniors, such as redesigning jobs to help them continue to work and helping them to take part in the gig economy. One concern about Singapore's ageing population is the toll it could take on the economy. An IPS study said it will cause a drag of 1.5 percentage points on per capita gross domestic product growth annually until 2060, assuming zero immigration and a stagnant fertility rate. Monetary Authority of Singapore managing director Ravi Menon yesterday said that the economy can remain dynamic - provided that certain steps are taken. For instance, he noted, Singapore's childcare workers earn just 38 per cent of the national median wage. Those in Australia pull in earnings at 91 per cent of the national median. This shows the scope that Singapore has to "professionalise" such rank-and-file jobs, which would help the economy remain competitive as the workforce ages. The Republic should also be increasingly concerned about the skills of the foreign workers that it takes in, rather than just the numbers, he added. "In fact, more skilled foreign workers will mean that we will need less of them," said Mr Menon, adding that as Singapore pursues innovation, it will need to attract highly skilled intellectual capital that it may not already have. 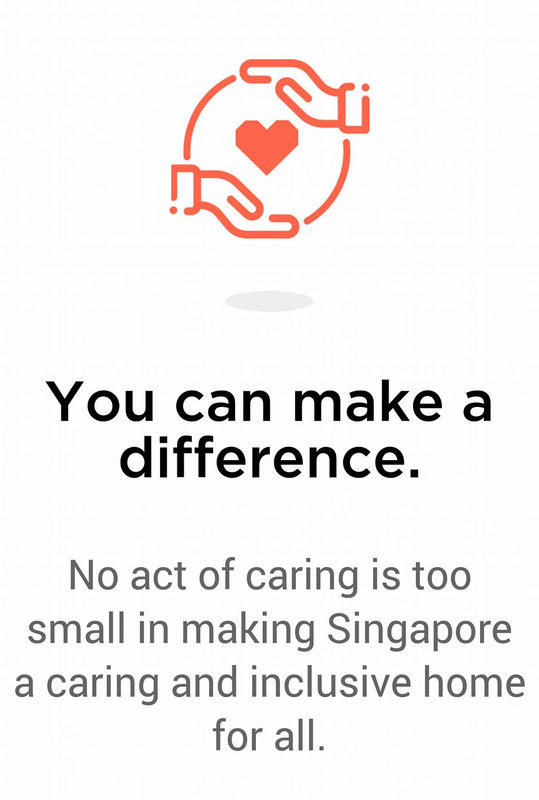 Every day, hundreds of blood units are given to the sick and injured across Singapore. Before donated blood reaches the patient, however, it passes through many steps - a process that is kept up even during seasonal dips in blood donation. Here is a look at what goes on behind the scenes, how the national blood supply is maintained, and key facts about blood and its medical uses. Under fluorescent lights and amid the steady humming of machines in the background, large insulated cooler boxes - similar to those typically used to store cold drinks - are wheeled in on pushcarts. One by one, the lids of the boxes are unfastened, revealing transparent packets filled with an opaque, carmine liquid. People donning papery lab scrubs sift through these palm-size blood bags and arrange them neatly on a plain grey bench. Work has begun at the Health Sciences Authority's (HSA) blood processing laboratory, a spacious set-up behind the walls of the blood bank at Outram Park, where donors stream in and out daily. Every day, more than 300 packs of donated whole blood pass through this facility, which handles all donated blood in Singapore. Blood comprises three main components: red blood cells, platelets and plasma. A donor can give blood in its entirety - referred to as "whole blood" donation - or only the platelets and plasma. Donations are, however, entering a seasonal dip. When festive periods roll around, such as the upcoming Chinese New Year next month, blood donations can slide by up to 20 per cent, said the Singapore Red Cross Society. People could be busy preparing for the celebrations or choose to travel, said its spokesman. "For most people, blood donation may not be on their minds, especially if it's not part of their routine." In addition, those who returned from countries with known risks of infections, such as Bangladesh and Cambodia, are not eligible to donate blood, he added. While there is usually enough to tide over these periods, some blood types could hit low levels. Said an HSA spokesman: "Most of the time, we can meet the minimum required stock. However, the stock of specific blood groups, such as O, tends to fall during festive seasons and long public holidays." This is because most of Singapore's population are blood type O. Not only that, type O blood comes in especially handy during emergencies - it is given to patients whose blood types are unknown. "Therefore, it (type O blood) is more susceptible to fluctuations." The HSA perennially maintains at least six days' worth of blood in the national inventory "to ensure we have enough blood to respond to any civil or medical emergencies". When its first buildings are ready in five years, Punggol North could become something of a mini Silicon Valley in Singapore - a centre for digital and cyber-security industries that generates up to 28,000 digital economy jobs. The masterplan for the 50ha Punggol Digital District was launched yesterday by Deputy Prime Minister Teo Chee Hean at Waterway Point mall, together with an exhibition on what the district would look like. Speaking at the event, Mr Teo said the plan is to make Punggol "a hub for key growth sectors of the digital economy", and that could even involve moving government agencies, such as the Cyber Security Agency of Singapore - currently in Maxwell Road - to the district. "This will help create a new cluster of cyber-security and technology firms in Punggol. Our residents can look forward to many exciting jobs in the future close to home." The district will also serve as a test bed for a slew of new features and planning practices. The zoning rules - which affect land use and density - will be applied on a district level instead of on individual land parcels, giving developers more flexibility. The area will also be car-lite, with infrastructure such as parking spaces located underground. That leaves the streets for pedestrians, cyclists and users of personal mobility devices. It will be connected to other parts of Singapore by a host of new transport infrastructure, including the new Punggol Coast MRT station. The Singapore Institute of Technology's (SIT) new campus will also be in the district, a move that Mr Teo said would create opportunities for students and faculty to exchange ideas with industry practitioners working there. Punggol Digital District is a pilot project for what is being termed an "enterprise district", with the authorities studying if this model can be applied to other areas in future. The new district is a collaboration among four agencies - the Urban Redevelopment Authority, Infocomm Media Development Authority, JTC and SIT. Are you willing to pay more taxes to fund higher social spending for the elderly? 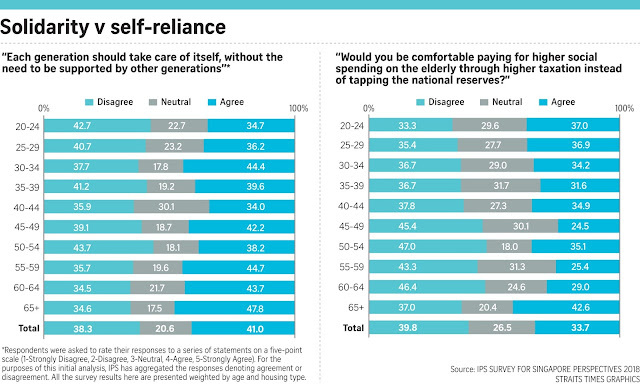 Or should the national reserves be tapped instead? If that seems a difficult conundrum to you, you are not alone - a new survey by the Institute of Policy Studies (IPS) has found that Singaporeans are divided on the issue. Two in five respondents - or about 40 per cent - said they were not comfortable with higher taxes and would rather tap reserves. A slightly lower proportion - about 34 per cent - indicated the opposite. The remainder were neutral. In particular, those aged 45 to 64 - sometimes called the "sandwiched generation" as they have to support both young and old - were most likely to frown on higher taxes. The survey also found that 41 per cent believed each generation should take care of itself, without needing to be supported by other generations. An almost equal proportion - about 38 per cent - disagreed. 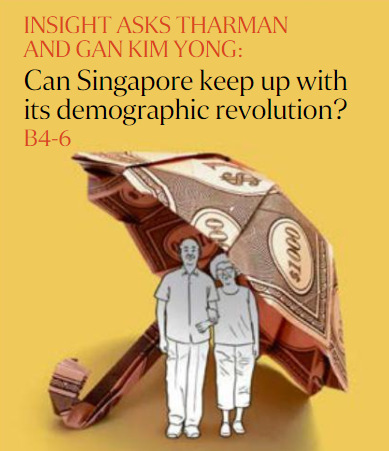 This issue of "intergenerational solidarity" - which the survey delves into - is particularly important today as Singapore grapples with how to fund social spending for an ageing population, said IPS in its report. "There is a tension between self-reliance and a sense of community. The results actually show that we can't decide whether we should take care of ourselves or if we should care for other generations," said IPS senior research fellow Christopher Gee - one of the study's authors - at a briefing yesterday. That tension is reflected in responses to other survey questions. About 41 per cent of respondents disagreed that older generations should set aside assets as an inheritance for the young, compared to 30.4 per cent who agreed. Those aged 50 to 64 were much more likely to disagree that assets should be set aside for inheritance, with about half or more of respondents in those age groups doing so. The survey of 2,000 citizens and permanent residents aged 21 and above was carried out through phone interviews last November and December. The study's other authors are research assistant Yvonne Arivalagan and post-doctoral fellow Chao Fengqing. Mr Gee noted that the sandwiched generation are now experiencing the highest tax burden and may be feeling the greatest uncertainty about financing their own post-retirement living expenses. "They are feeling these twin pressures and may need something to help them have that intra-and intergenerational solidarity," he said. 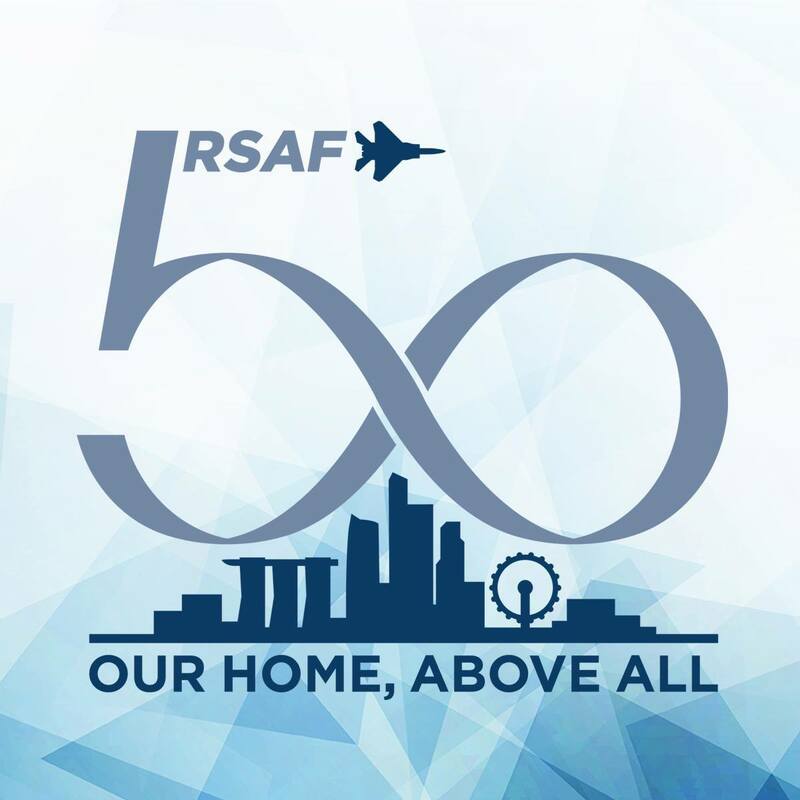 An aerial flypast of more than 20 aircraft over the Marina Bay area during the National Day weekend will be one of the key events for the Republic of Singapore Air Force (RSAF), which is marking its 50th anniversary this year. Other events include another aerial display featuring one F-15SG and two F-16C fighter jets at the Singapore Airshow next month, heartland exhibitions across the island between March and May, and a commemorative parade with Prime Minister Lee Hsien Loong as the guest of honour on Sept 1. 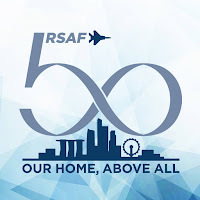 The RSAF50@Marina Barrage event will take place during the Aug 11 to 12 National Day Parade weekend, and the flypast will include unmanned aerial vehicles (UAVs) for the first time. All types of flying assets - fighters, helicopters, UAVs and transport aircraft - will be represented. There will also be an aerial display performance by a formation of two AH-64D attack helicopters, and F-15SG and F-16 fighter aircraft. The air force will also be taking the celebrations to three new heartland locations this year - Bedok, Sembawang and Punggol. This is in addition to two locations - Toa Payoh and Jurong East - where the RSAF also had heartland activities to mark its 45th anniversary. The heartland exhibitions this year will each last for two days over a weekend. Other than exhibition panels and static aircraft displays, another first will be live demonstrations at each event, such as a display of helicopter operations at the Sembawang event from March 31 to April 1. The events were announced by Brigadier-General Kelvin Khong, who chairs the RSAF50 steering committee, during a media briefing at the Air Force Museum in Paya Lebar yesterday. Explaining the theme of the celebration, BG Khong, 41, who is also the Chief-of-Staff (Air Staff), said: "The air force is here defending Singapore, but more than that, we are here for Singaporeans. That is why we have designed our themes to be 'Our Home, Above All'." I agree with Mr Ong Junkai on the need to moderate the mindsets of radical animal rights activists (Curb radical animal rights activists; Jan 16). In this light, I would like to highlight the recent stir from an Instagram post by MP Baey Yam Keng, who warned residents about stray dogs in Tampines. It was an innocuous post for residents to be on the lookout, for their own safety. However, because of concerns that the authorities would take note of the stray dogs and put them to sleep, there was a backlash by animal lovers and activists, who criticised Mr Baey and called him names online. They also insulted netizens who approved of Mr Baey's post. It is ironic that these activists respect animals but do not accord decency to fellow human beings. These activists adopted an extreme stance towards animal welfare, and did not consider co-existence - striking a balance between their fervour for animals and the safety of people. It was right of Mr Baey to warn residents about the stray dogs. After all, he has a responsibility as an MP to ensure the residents' safety. Unless these activists agree to moderate their discourse and settle issues amicably, they ought to be curbed by the authorities before they pose a threat to society's harmony. Seven years from now, Singaporeans and Malaysians will be able to hop on an MRT train every eight minutes to get across the border. The completion of this Rapid Transit System (RTS) Link, following the signing of a legally binding agreement yesterday, is expected to ease the daily congestion at the Causeway. Other bilateral projects on the cards include schemes to raise the water levels in Johor's Linggiu Reservoir to meet the needs of both countries. And one possibility is a joint hydrometric modelling study of the Johor River. These projects underscore the excellent relations between their countries, prime ministers Lee Hsien Loong and Najib Razak said, adding that ties will not be affected by domestic developments on either side, including an imminent general election in Malaysia. Datuk Seri Najib, when asked for his outlook on bilateral ties this year, said: "I don't expect elections to change the nature of relations between our two countries." Mr Lee said Singapore and Malaysia are constantly looking for new areas of cooperation. "It is a sign of our confidence in each other's future, and commitment to good relations with one another." The two leaders discussed various issues, including water supply, during their eighth Singapore-Malaysia Leaders' Retreat at the Istana yesterday. They noted that demand for water from Linggui Reservoir will rise as more developments come up in Iskandar, Johor, and Singapore. Although the reservoir has filled up in the past year, it is unclear when the next prolonged dry spell will hit, Mr Lee noted. Mr Najib said a detailed hydrometric study will be commissioned to produce technical proposals "to increase the water supply for both Singapore and Johor". 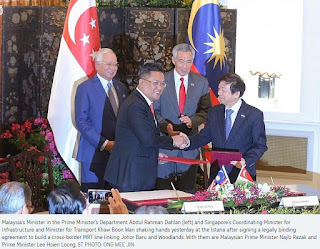 The two leaders also witnessed the signing of the RTS Link agreement by Coordinating Minister for Infrastructure Khaw Boon Wan, who is also Transport Minister, and Malaysia's Minister in the Prime Minister's Department Abdul Rahman Dahlan. This is the second agreement in two years, following the 2016 pact to build a high-speed rail line between Kuala Lumpur and Singapore. Construction of the 4km link is expected to begin next year. Mr Lee said the cross-border service will benefit thousands of daily commuters. "It will provide a convenient means for Johoreans to come to Singapore to work or to play, and Singaporeans to go to Johor to study, to work, to shop," he added. 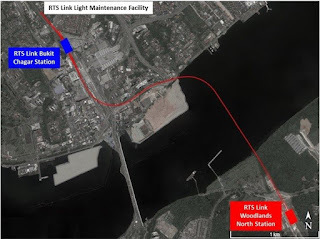 Mr Najib said the link will provide "seamless connectivity" and the required capacity. Up to 10,000 passengers an hour can travel in each direction between Johor's Bukit Chagar terminus station and the Singapore terminus in Woodlands North, where it will join the upcoming Thomson-East Coast Line (TEL). When the RTS Link begins service, commuters can hop on a train every eight minutes on average. Trains will eventually arrive every four minutes on average during peak periods. The line will start with five trains, and gradually have a total fleet of seven trains. Commuters can transfer to the TEL concourse via an underground link, without having to exit the RTS station. On how both sides will ensure the RTS Link and high-speed rail line will not be affected by political and other changes, Mr Lee said the long-term commitment has been formalised in the binding agreement signed yesterday. "Whoever is the government on either side, this is an agreement which they inherit... If a subsequent government has other ideas, well, that will have to be dealt with and the agreement will deal with these contingencies," he added. Commuters like Ms Chen Zihui who travel regularly to Johor Baru look forward to the RTS. The 26-year-old bank associate visits her family in Johor Baru every weekend. "Sometimes, I get caught in the jam at the Causeway," she said of the two-hour commute by bus or taxi. "I hope the RTS will reduce my travel time to Johor Baru." 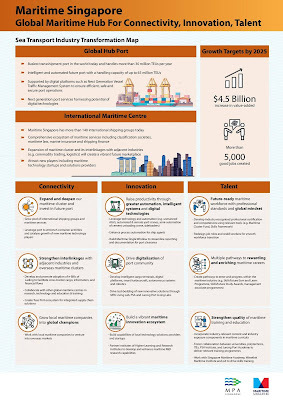 Maintaining Singapore's thriving maritime industry as a world leader is the central theme of an ambitious new blueprint for the sector unveiled yesterday. It underlined just how vital the industry is for the economy while also laying out the challenges it faces to maintain and strengthen its position amid fierce global competition. The Sea Transport Industry Transformation Map (ITM), as the strategy is called, noted that Singapore starts from a position of strength. Container throughput rose 8.9 per cent to 33.7 million containers last year, while the maritime industry as a whole employed more than 170,000 people and contributed 7 per cent to the economy. "While 2017 was a better year than the last, we watch with cautious optimism, as the road ahead remains challenging. Indeed, we have to continue to paddle hard to stay ahead," said Dr Lam Pin Min, Senior Minister of State for Transport and for Health. He made it clear that major changes lie ahead, from port workers upgrading skills to management grappling with radical new technology. The sector is in for "real and deep transformation over the next few years", he noted. "We must fundamentally relook the way we operate... as well as the kind of capabilities our maritime workforce needs," he said. 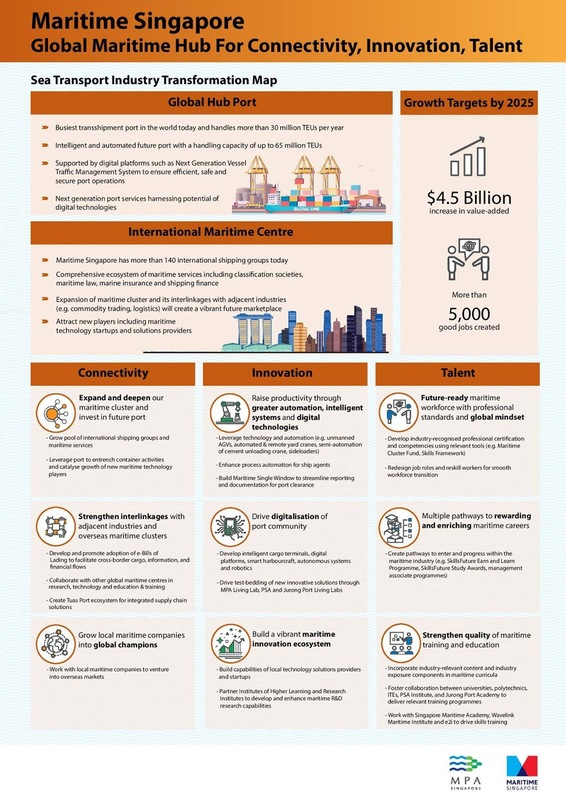 The ITM has an overarching vision: to make Singapore a global maritime hub for connectivity, innovation and talent. That, in turn, means expanding the sector's value-add by $4.5 billion and creating over 5,000 good jobs by 2025. Dr Lam said at the ITM launch ceremony at PSA Pasir Panjang Terminal Building 3: "We not only have to continue to deliver world-class port services, we must also capture new growth opportunities." One key strategy is to build up a well-connected international maritime centre cluster. That will involve the Government continuing to boost the port's physical connectivity by anchoring and attracting shipping lines here. More initiatives, such as the inaugural Maritime Capital Forum last year, will also be rolled out to develop the maritime financing landscape here. Another key thrust is to drive growth through better productivity and innovation, particularly by using automation and digitalisation. The Maritime and Port Authority of Singapore (MPA) is developing technology platforms to facilitate the sharing of vessel and cargo-related information with the wider trading community. It is also looking at digitalising trade and maritime documentation, like using electronic bills of lading. The Singapore Maritime Institute will invest $12 million to set up the Centre of Excellence in Modelling and Simulation for Next Generation Ports that will enhance the Singapore port's ability to handle increasingly complex operations. The Government will do more to bring well-trained personnel into the industry, said Dr Lam, adding that most of the 5,000 new jobs to be created will be professional, manager, executive and technician roles. Those in more traditional jobs will undergo skills upgrading as jobs evolve with increasing automation and digitalisation. This year, two maritime SkillsFuture Earn and Learn programmes launched earlier in 2016 will be open to more graduates, enabling junior seafarers to deepen their skills to take on higher-level jobs. The ITM is the first of eight road maps to be launched this year. A total of 15 ITMs have already been set in motion as part of a $4.5 billion industry transformation package announced in Budget 2016. To earn the trust of the people, each generation of Singapore's leaders needs to be upfront and accountable, as well as find new ways to communicate, Minister in the Prime Minister's Office Chan Chun Sing said yesterday. Only then can leadership teams make difficult but necessary decisions, while still keeping faith with the people, he added. Mr Chan, tipped as one of the three front-runners to be Singapore's fourth prime minister, laid out his vision of how each generation of leaders should carry out their duties. He was speaking at the inaugural S R Nathan Hard Seats Lecture, inspired by Mr Nathan's remark that Singapore was built "because his generation did not believe in sitting on cushy seats, but on hard seats". In a wide-ranging speech, the minister, an economics graduate of Cambridge University, described leadership as one of the things that Singapore needs to get right to continue to thrive. The others were geopolitics, economic survival and forging a sense of nationhood. 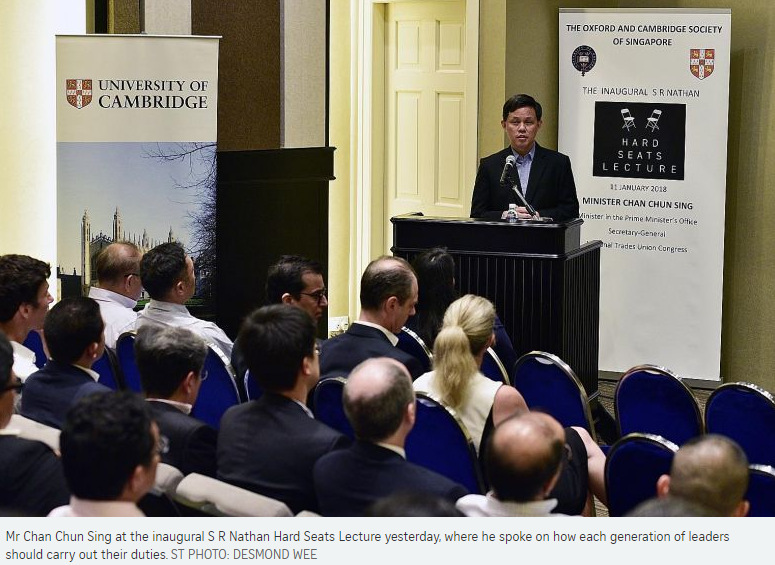 "Ultimately, people and government must work together to keep Singapore successful," he told the 90 people at the event organised by the Oxford and Cambridge Society of Singapore. Mr Chan noted that "trust" was described by late founding prime minister Lee Kuan Yew as his team's "greatest asset". It allowed the pioneer generation of leaders to be effective and not shy away from making difficult but necessary decisions, such as introducing mandatory national service when the country needed to build a defence force. Mr Chan listed three things that leaders must do to build trust with their people. First, they need to be upfront and help people understand the issues at stake and the trade-offs involved in policy considerations. Second, they must keep finding new ways to communicate with people, especially in an age when "inaccurate or misleading information can 'go viral', possibly clouding a person's view on an issue". Third, they must be accountable and responsible, he said, adding: "That means making good on our promises. And when there are problems, we work hard to put things right immediately." It also entails being nimble and consultative in meeting people's needs, while making sure that finite resources are used wisely, he said. "These are important so that we do not face a trust deficit and run the risk of citizens disconnecting with or being disenfranchised by the Government. We have seen this happen in other countries, and we can't take for granted that it won't happen in Singapore," he added. I applaud Mr Leon Perera for his apology in Parliament, but actions should be taken to prevent similar incidences (Parliament: WP's Leon Perera apologises, withdraws statements on Mediacorp's editing of parliamentary footage; ST Online, Jan 8). With the resurgence of fake news, there is a possibility of Parliament being manipulated by outside forces or parliamentarians using unreliable information. Parliament has utmost authority in Singapore and any manipulation could be harmful for the country. Steps need to be taken to prevent Parliament from being misled. This could involve increasing the accountability of parliamentarians, which can be done through live telecasting of parliamentary proceedings. A trial of this should be done. Live telecasts would allow Singaporeans access to Parliament, hence putting public pressure on parliamentarians to be accountable, for instance, sticking to statements made by them in and out of Parliament, or being cognisant of the details of any cases they bring up. Live telecasts would also prevent any further questions on the neutrality of parliamentary reports. As Singapore's democracy evolves, new measures must be taken to deter those who wish to manipulate Parliament. Parliament must evolve as well, or face further problems in the future.